First off we are extremely sorry for the lack of posts on here recently. Being down with the cold, papers, assignments, exams, and prom dressing shopping is just some of the excuses we have for being MIA on the blog. But we are sooooo excited to share with our readers this amazing feature we've been working on and dying to share with you all! We were recently approached by COSMOPOLITAN - India magazine to do a feature. The idea behind the feature was to choose a staple piece and style it in multiple ways. 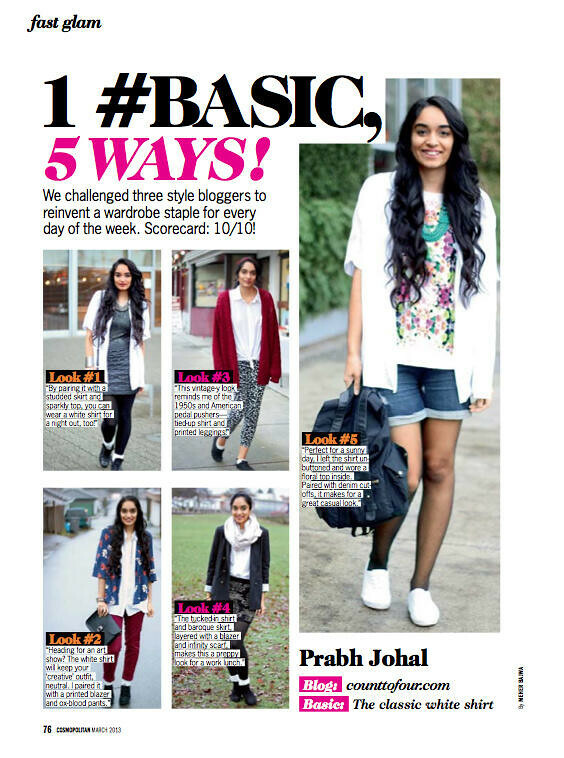 Prabh chose to style a white collared shirt, which is a must have basic in anyone's closet. You can see in the spread the different ways she styled it, from casual to a night out, a white collared shirt can be so versatile. We were so honoured to be featured in such a popular magazine and had so much fun doing this project! For our Indian readers, don't forget to pick up this March Issue of Cosmo India! Awww congrats girls!!! What an amazing features. :) You guys did a great job!! Cosmo? That's HUGE! Congrats to you girls. wow, congrats girls !! u look great in d feature too. You guys, that is so so awesome!!!! Congratulations, wonderful news! Wow that's fantastic! Congratulations on the Cosmopolitan spread! Great! Congratulations on Cosmopolitan feature! It's so cool that you were approached by them. Cosmo is such a huge magazine too! Whoa!! Big congrats to you! That's so amazingly exciting! Congrats! How amazing is that!!?! Yay!! congrats! Love ur hair! Nice blog and post! I think I will be here more often, I'm your new follower! Don't forget to check out my blog&facebook&youtube! Congrats on your feature! How exciting! This is pure glam news! So exciting and wonderful~and you look fabulous in the shot! Looking forward to more posts.. Such amazing news, congrats guys! Congrates, Love your COSMOS style. Wow, congrats on the feature in Cosmo India...that's awesome! If you have a chance, I would love for you to stop by my blog and check out my latest post...and stay tuned for tomorrow's giveaway! Have a great day. Lovely blog babe!!! :) Mind follow each other? I follow back just leave a comment on my post and I will be glad to follow back! Congratulations!!!!! That is so exciting - I'm so happy for you guys! :) You deserve it! omg *_* congratulations! your blog is very lovely and interesting. im glad if you visit m y blog, too <3 keep in touch! An Indian Fashion n Travel Blogger! I just stumbled accross your blog and I really like what I have seen so far. You have such a great and unique blog, I have really enjoyed reading your posts! Anyways, maybe, you might consider following each other? Congratulations, all 5 amazing outfits, you nailed it! With all the changes on Blogger, would you like to follow each other on Bloglovin? Wow! Congrats on the feature in the Cosmo magazine! You obviously have great style! Can't wait to see more outfit posts in the future!